The Djab wurrung, also Tjapwurrung, people are Indigenous Australians who occupy the volcanic plains of central Victoria from the Mount William Range of Gariwerd in the west to the Pyrenees range in the east encompassing the Wimmera River flowing north and the headwaters of the Hopkins River flowing south. The towns of Ararat, Stawell and Hamilton are within their territory. There were 41 Djab wurrung clans who formed an alliance with the neighboring Jardwadjali people through intermarriage, shared culture, trade and moiety system. Tjapwurrung, meaning 'soft language', belongs to the Western branch of the Kulin languages. 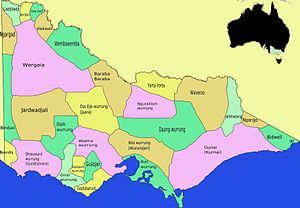 It was the southern most version, with Djadjawurrung spoken to the east/southeast, and Yartwatjali spoken in the area from Casterton northwards to Donald. The Djab wurrung language shared 85 percent common vocabulary with Yartwatjali, 82 with Wemba-Wemba, 66% with Madhi Madhi and 68% with Letji-Letji. The Tjapwurrung's lands extended over 2,700 square miles (7,000 km2), ranging from Mount Rouse westwards to Hamilton. To the east its boundaries ended at the Hopkins River and Wickliffe. The northern boundary lay near Mount William, Stawell, Ararat and the Dividing Range. The Tjapwurrung are known to have had at least eleven hordes. They have a two class matrilineal system, with descent based on the gamadj (red-tailed black cockatoo) and grugidj (sulphur-crested cockatoo or Long-billed corella white cockatoo) moieties. Grugidj sub-totems included pelican, parrot, mopoke and large kangaroo. Gamadj sub-totems included emu, whip snake, possum, koala, and sparrowhawk. Clans intermarried with the Dja Dja Wurrung, Jardwadjali, Dhauwurd wurrung and Wada wurrung peoples. In mid summer, gatherings for ceremony and hunting took place at Mirraewuae, a marsh near Hexham rich with emu and other game. Tom Wills family moved to a station, Lexington, near Ararat around 1840, when he was 5 years old, and he grew up often playing with the local aboriginal kids and learning the local dialect. He was influential later in introducing the 'catch' and 'kick' style, and in establishing and codifying Australian Rules football, although whether Marn Grook influenced the development of the game is still being debated. Some of the Djab wurrung clans are thought to have practiced burial of their dead in trees. According to Hyett there have been two recent discoveries to the west of Ararat of secondary tree burials, involving the re-interment of two or more individuals, and a primary interment of a child in a hollow tree in the vicinity of Stawell. The Djab wurrung occupied their lands for up to 40,000 years, although the oldest known occupation site, in Gariwerd, is dated at 22,000 BP. It is likely the Djab wurrung were well aware of Europeans from their communications with coastal tribes. Their first explicit contact was with Major Thomas Mitchell exploring western Victoria in September 1836 when he surprised two women of the Utoul balug and their children near Mount Cole. Two years later, in 1838, a squatter invasion began with colonials and their sheep flocks settling in Djab wurrung country. European Settlement from 1836 was marked by resistance to the invasion often by driving off or stealing sheep which then resulted in conflict and sometimes a massacre of aboriginal people. From 1840 to 1859 there were reports of 35 massacres and killings of Djab wurrung people, most occurring before the end of 1842. Very few of these reports were acted upon to bring the settlers to court. Resistance also took the form of maintaining connections to country and culture through whatever means were available. On the Campbell brothers Mount Cole run, settled in 1840, the Beeripmo balug and Utoul balug clans were allowed to stay on the run and were actively supplied with food and clothing establishing a relationship of care and protection. The Campbell brothers discouraged white employees from visiting the out-stations further reducing possible interaction and conflict. Archeological evidence shows that the Beeripmo balug and Utoul balug maintained their connection to country, culture and food diet well into the 1860s on the property. In 1841 Kolorer (Mount Rouse) and Burrumbeep were gazetted as aboriginal reserves, although only the Kolorer reserve was used by Djab wurrung. In 1842 and 1843 Kolorer was used as a base to launch guerilla attacks against the growing squatters and their sheep and then retreat to the reserve which was under the protection of the Assistant Protector of Aborigines, Charles Sievwright. Resistance to the European invasion peaked between 1840 and 1842. By 1848 all the Djab wurrung lands had been squatted and resistance had been broken through the use of Border Police and the Native Police Corps. By 1845 the Djab Wurrung population had dropped from a conservative pre-contact estimate of 2050 to 615. Three quarters are estimated to have been killed by introduced diseases, poisoned flour, diseased blankets and starvation due to shortage of traditional foods, and a quarter killed by rifle attack. During the gold rush period the Djab wurrung saw large numbers of European and Chinese people camping on their land in search for gold, but the search for gold also attracted many station hands, and so Djab wurrung people often found employment as station hands and in menial jobs around the stations during this period. In the 1870s the Djab wurrung were largely dispersed to the reservations: the Hamilton mob to Lake Condah, the Wickcliffe people to Framlingham mission, and the Mount Cole people to Framlingham and Coranderrk station. In 1989 there was a proposal by Victorian Minister for Tourism, Steve Crabb to rename many geographical place names associated with aboriginal heritage in the Gariwerd - Grampians National Park area. There was much community opposition to this proposal. The Brambuk centre, representing five aboriginal communities with historical links to the area, advocated a dual name for the main area: Gariwerd/Grampians. Halls Gap to Budja Budja. Tyapwuru, Tyapwurru, Chaap Wuurong, Chaapwurru, Djabwuru. Pirt-kopan-noot (This is a dialect name to the north round Ararat). Nutcheyong (The name of one of its hordes at Moyston). Kolor (toponym of Mount Rouse), Kolor Kuurndit, Kooloor, Kolorer,. Girriwurra (name of a horde near Maroona). Bolagher (perhaps a toponym from Lake Bolac, yet it may have denoted, according to Norman Tindale, the northwestern horde of the Kirrae). ^ Beveridge writes of the football used among the riverine Murray tribes uch as the Tatitati, Latjilatji, Jitajita, Nari-Nari, Barapa Barapa, Warkawarka, Watiwati, Wemba-Wemba etc., that 'the women participate in this game as well as the men. I have seen as many as 200 (including both sexes) engaged in this game at one time. The ball is composed of old opossum skin tightly rolled up and covered with a fresh piece of skin firmly sewed together with opossum tail sinews; before they begin to play they arrange sides, each side having a captain, whose place it is to guide and control an oftentimes unruly squad. When all is in order a lyoor starts off with the ball in her hand; she walks a little way out from her own side and towards that of their opponents, drops the ball with seeming carelessness, but ere it has time to reach the ground she gives a dexterous and by no means a gentle kick, which being correctly aimed sends the ball into the air. Thereupon the fun begins in downright earnest...They have not any appoint ted goal to which the ball has to be driven; the whole of the play merely consists of keeping the ball in motion, and preventing its coming to the ground, whilst the strugglers of the game all tend to keep the ball from being captured by the opposing side. Those holding the ball throw it from one to the other of their own side, and it is whilst this is going on that the non-possessors strenuously run and jump to intercept it in its flights. As the eyes of the players are never by any chance bent on the ground, tumbles during the game are numerous and frequently ludicrous, more especially when one goes down, and so becomes a stumbling block over which a dozen or more come toppling in a heap; these incidents, however, add mirth unto the fun, without creating the least ill temper. ^ a b c d Clark 1995, p. 57. ^ a b Blake 2011, p. 8. ^ Blake 2011, p. 9. ^ Mitchell 2011, p. 245. ^ a b Clark 1995, p. 58. ^ Mallett 2002, pp. 10–11. ^ Lourandos 1997, p. 65. ^ Beveridge 1883, pp. 52–53. ^ a b Mallett 2002, p. 12. ^ Richards, Bennett & Webber 2013, pp. 62–72. ^ Clark 1995, pp. 57–83. ^ Wolski 2001, pp. 225–226. ^ a b c Clark 1995, pp. 58–60. ^ Mallett 2002, pp. 8–9. ^ Kostanski 2014, p. 275. ^ Pieris 2016, p. 48. Beveridge, Peter (1883). "Of the aborigines inhabiting the great lacustrine and Riverine depression of the Lower Murray". Journal and Proceedings of the Royal Society of New South Wales. 17: 19–74. Blake, Barry J. (2011). Dialects of Western Kulin, Western Victoria Yartwatjali, Tjapwurrung, Djadjawurrung (PDF). LaTrobe University. Clark, Ian D.; Harradine, Lionel L. (1990). The Restoration of Jardwadjali and Djab wurrun names for Rock Art Sites and Landscape Features in and around the Grampians National Park. Koorie Tourism Unit. Clark, Ian D. (1995). Scars in the Landscape: a register of massacre sites in western Victoria, 1803–1859 (PDF). AIATSIS. pp. 57–84. ISBN 0 85575 281 5. Dawson, James (1881). Australian Aborigines: The Languages and Customs of Several Tribes of Aborigines in the Western District of Victoria, Australia (PDF). Melbourne: George Robertson. Kostanski, Laura (2014). "Duel-Names: How toponyms (placenames) can represent hegemonic histories and alternative narratives" (PDF). In Clark, Ian D.; Hercus, Luise; Kostanski, Laura (eds.). Indigenous and Minority Placenames: Australian and International Perspectives. Australian National University Press. pp. 273–292. ISBN 978-1-925-02162-2. Lourandos, Harry (1997). Continent of Hunter-Gatherers: New Perspectives in Australian Prehistory. Cambridge University Press. ISBN 978-0-521-35946-7. Mallett, Ashley (2002). The Black Lords of Summer: The Story of the 1868 Aboriginal Tour of England and Beyond. University of Queensland Press. pp. 169–175. ISBN 978-0-702-23262-6. Mitchell, T. L. (2011) [First published 1838]. Three Expeditions Into the Interior of Eastern Australia: With Descriptions of the Recently Explored Region of Australia Felix and of the Present Colony of New South Wales. Volume 2. Cambridge University Press. ISBN 978-1-108-03063-2. Richards, Thomas; Bennett, Catherine M; Webber, Harry (2013). "A post-contact Aboriginal mortuary tree from southwestern Victoria, Australia". Journal of Field Archaeology. 37 (1): 62–72. doi:10.1179/0093469011z.0000000005. Tindale, Norman Barnett (1974). "Tjapwurong (VIC)". Aboriginal Tribes of Australia: Their Terrain, Environmental Controls, Distribution, Limits, and Proper Names. Australian National University Press. ISBN 978-0-708-10741-6. Wolski, Nathan (2001). "All's not quiet on the Western Front - rethinking resistance and frontiers in Aboriginal historiography". In Russell, Lynette (ed.). Colonial Frontiers: Indigenous-European Encounters in Settler Societies. Manchester University Press. pp. 216–235. ISBN 978-0-719-05859-2.